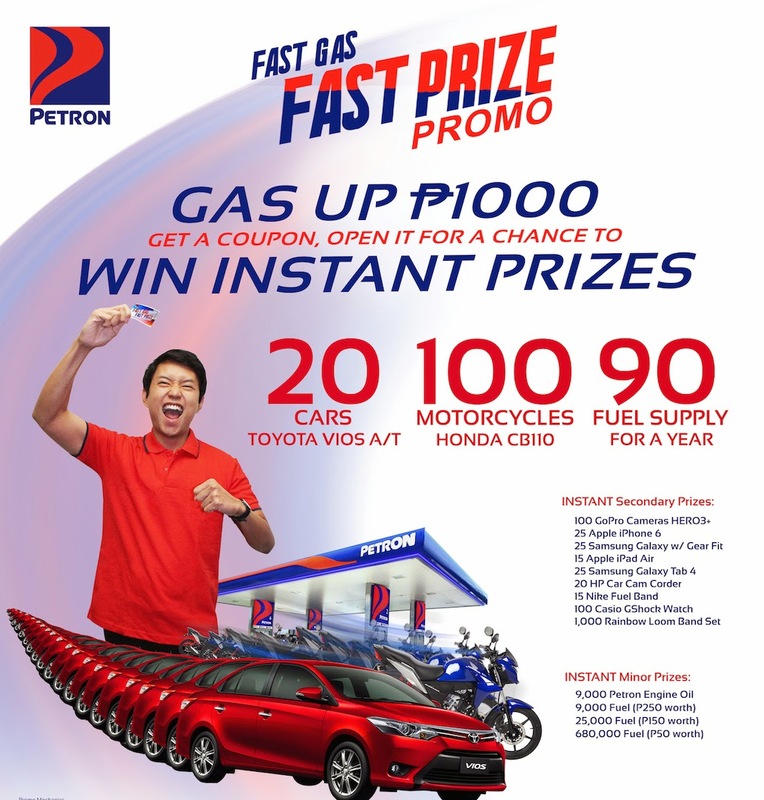 Loyal Petron customers will have the instant sur-prize of their lives when the oil industry leader rolls out its biggest ever promo, starting from November 15, 2014 to February 15, 2015. Veering away from the usual raffle draw, Petron’s “Fast Prize” promo will give customers a peel-apart coupon for a chance to win an awesome instant prize. For every P1,000-worth of single or accumulated purchase of Petron Blaze 100, XCS, Xtra Advance, Super Xtra, Turbo Diesel or Diesel Max from a participating Petron station, you get one coupon. Accumulated receipts should be from the same “suking” Petron station. Instant prizes at stake include the following major prizes: Toyota Vios automatic transmission cars (20 winners), Honda CB110 motorcycles (100 winners), and Petron Value Card points worth P88,000 equivalent to free fuel for a year (90 winners). There are over half-a-million prizes being given away at more than 2,000 participating Petron service stations nationwide. Secondary prizes are Go Pro camera Hero3+ (100 winners), Apple iPhone 6 16GB (25 winners), Samsung Galaxy S5 with Samsung Gear Fit (25 winners), Apple iPad Air with retina display 16GB (15 winners), Samsung Galaxy Tab 4 (15 winners), HP car camcorder F310 (20 winners), Nike Fuel band (15 winners), Casio G-Shock watch (100 winners), and Rainbow Loom Band set (1,000 winners). You can win an on-the-spot instant minor prize, such as Petron engine oils, P250-worth of fuel, P150-worth of fuel, and P50-worth of fuel. Minor prizes can be claimed instantly from any Petron station, upon presentation of the winning coupon, and must be redeemed with 60 days from end of promo period. Secondary and major prize winners should call the Petron hotline (02-802-7777 for Metro Manila or 1-800-100-738766 for other provinces) for detail verification and to arrange the Petron service station nearest the winner, where the prize can be claimed. Secondary prizes will be available and shall be awarded within 1-month upon recording of winner’s details, and upon presentation of 2 government IDs. Prizes are not cash-convertible, but are transferable. Major prizes can only be claimed upon presentation of the winning coupon, the Petron service station receipt, and two government IDs. For vehicle winners, the 20% prize tax over P10,000 as well as registration and shipping charges will be shouldered by Petron; transfer of registration to winners’ name should be paid by the winner. With a total of 724,525 instant prizes at stake, you have many chances of getting an instant reward from Petron’s Fast Gas, Fast Prize promo. Hurry, there just might be a brand new vehicle or the latest gadget just waiting for you at your favorite Petron service station. Don’t miss out, keep yourself posted by liking the “Petron Corporation” page on Facebook.